Three Physiotherapists on site – Geoff Austen, Andrew Singh and Lachlan Watson. 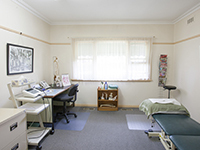 Physiotherapy services include; Musculoskeletal and sports physiotherapy. 30 minute “hands on” appointments. On site private health rebates. Concession rate to over 65’s. EPC patients accepted. Opening hours are 9am – 6pm, Monday to Friday. Contact Rosanna Physiotherapy on the above numbers for further details. We respect your privacy and won't share your details with anyone.